Expert plantswoman Clausen makes keeping deer away as simple as choosing the appropriate plant. Instead of the typical barriers and fencing, Clausen has chosen the 50 most beautiful (and least palatable) annuals, bulbs, ferns, grasses, herbs, perennials, and shrubs. From the Back Cover In 50 Beautiful Deer-Resistant Plants , gardening expert Ruth Rogers Clausen introduces the most versatile and drool-worthy options: white snowdrops that bloom in the spring; shade-loving, electric gold hakone grass; long-blooming Texas sage in vibrant reds, peaches, and pinks; and the feathery foliage of Arkansas blue stars that glows golden in the autumn. 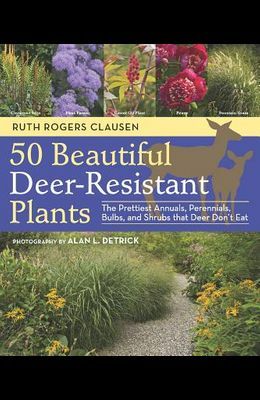 Illustrated throughout with full-color photographs of every plant, this inspiring guide offers everything a plant-lover with a deer problem needs to know. In addition to the 50 best annuals, perennials, bulbs, ferns, grasses, and shrubs--plus advice on how to grow them--Clausen includes dozens of deer-resistant companions and smart design tips for pulling it all together. And here's the best part: your gorgeous garden will be irresistible to everyone but those pesky deer.